Like many others on the Internet, I have become an “expert” in this field solely by virtue of the fact that people have come to me with their questions, prompted by the pictures of Hastings Maypole dances posted on my web site. Assuming such expertise is of value to you, feel free to send me questions. But first, please check through these “frequently asked questions” since I may have answered it already. I also welcome suggestions, comments, or corrections via e-mail: rick@smat.us. The dances were originally organized by Pam Thorsen of the Thorwood and Rosewood B&B’s, and was part of the Hastings annual Front Porch Festival (while it lasted, anyway). Eventually they were taken over by Kathy Slovik-Siemens. Answers to these questions have come from my recollections, and from answers provided by Kathy and Pam, and also by my daugher and her friends that participated. What’s the idea of Maypole dancing? My own limited research suggests that it’s a centuries old tradition from England and central Europe, but I wouldn’t be surprised to hear that it comes from somewhere else entirely. Years ago I found an essay on Maypole traditions that is the basis for much of what I’ve heard. There are all sorts of variations. The notion of young girls dancing around the May pole seems to be an English tradition. The pictures and reports I’ve seen of maypole dancing all seem to come from England or places where English people have settled. In Germany, there’s a different maypole tradition. The young men of a village treat maypoles as totems to be defended, and different villages strive to steal each others’ poles. If a young man has a sweetheart, he might erect a small maypole in front of her bedroom window. I’m not sure if Freud ever commented on that tradition, but I wouldn’t be surprised. In Hastings, the essential objective of the maypole dance was for some grade school kids to have fun and dress up in spring costumes. In our dances, the kids took long ribbons and wove them into a braid on a pole. As long as the kids don’t all get wrapped up the ribbons and trip over one another, the dance was judged a success. How many kids does it take? It’s pretty flexible. You could probably do it with as few as six or as many as twenty. A realistic number is around a dozen, or maybe sixteen. An even number works best. We’ve had toddlers dance (my daughter was four years old when she first participated), and the focus in Hastings was generally on grade school kids. Of course, there’s no reason older kids or adults couldn’t do a Maypole dance. Are the dancers girls only? Traditionally, the dancers are young girls, although there’s no real reason why boys can’t participate, too. Boys participated in the last Hastings dance in 1999. I’ve seen photos of dances at different times and places in which boys also participated. What’s the idea behind the costumes? The dance costumes try to evoke the notion of faeries, elves, and wood nymphs. That leaves the door open for a lot of creativity. What are the dresses the girls wearing in the photographs? According to legend, Pam Thorsen bought a pile of nylon nighties that were on clearance at the local discount store. To that, she added some spools of satin ribbon and wreaths of plastic flowers. These supplies were used for about ten years. The girls would put on the nylon nightgowns and add ribbons to decorate and to hold the gowns in place (some were absurdly large for a little girl to wear). Flowers went in the girls’ hair, or wherever else they’d stay in place. Ribbons went around waists, and anywhere else they were needed to ensure the gowns stayed where they belonged. Girls would also tie ribbons around the feet and legs. Except for the ribbons, the kids usually danced barefoot, since the dancing surface was usually a lawn. See the photographs for ideas about how to wrap the ribbons around feet. One Mayday was unusually cold and the girls wore sheer pantyhose for warmth. In 1999, the River Bend dance school organized the dance, and they took a different approach to costuming — the kids wore dance costumes instead. Girls wore leotards with skirts of varying lengths, and boys wore rustic, loose-fitting shorts and tops. I think the pole was a wooden pole (like a 1 inch diameter clothes pole, or possibly larger) with an optional decorative knob on top. It stood at least 8 feet high, give or take a foot, and was solidly anchored in the ground,so that the dancers wouldn’t pull it down. Just about any ribbon will do, assuming it’s strong enough to hold upduring the dance. How do the ribbons work? 1. For a simple dance, attach the ribbons to a disc and attach the disc to the top of the pole. Be sure it can spin. 2. For a dance that braids, attach the ribbons at the top of the pole so that they remain fixed in place. This allows the kids to make a braid on the pole as they dance. How does the disc work? We didn’t do it this way in Hastings, but I’ve seen photographs of it in other maypole dances. They attached the ribbons to a rotating disc at the top of the pole. In some cases the disc is replaced by a decorative thing, sometimes looking like a glorified lampshade. Evidently the kids just skip around the pole in such dances, and don’t bother with crossing one another or making a braid. How do we attach ribbons to make a braid? The ribbons must be attached firmly at the top. They must be attached firmly enough so that they won’t pull out and so that they won’t “spin” as the kids dance around the pole. The ribbons must wrap around the pole as the kids circle it. The kids must alternately duck under the ribbons or dance over them,so the pole has to be high enough to keep the ribbons above their heads (older kids can duck, of course). The ribbons must also be long enough sothey can be held near the ground, and kids can skip over them. How does the dance work? The ribbons are supposed to make a sort of braid on the maypole. The kids take turns dancing in different directions, and the changes in direction can cause the ribbons to wrap around the pole in varying patterns. Is this an easy dance? 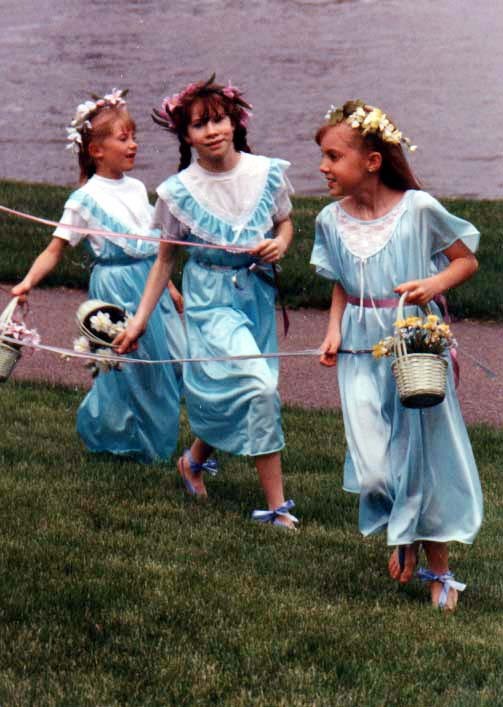 The easiest way to do a Maypole dance is to just have the kids go skipping around the pole, each holding the end of a ribbon so the whole thing looks like a rotating suspension bridge. It looks decorative that way, especially if the kids have costumes to wear. You can do this either by attaching the ribbons to the top of the pole in fixed positions, or by attaching them to a rotating disc. Simply skipping back and forth is easy to teach but won’t produce a braid. When the kids change direction, they’ll simply unwrap the ribbon they just wrapped around the pole. We need to continue the dance by moving in theother direction without unwrapping that ribbon we just wrapped around the pole. There are several ways to do this. Essentially, anything will work that snags the ribbon as it wraps in the other direction. We attached the ribbons to a spinning disc atop the maypole. How do we produce a braid? You can’t. The ribbons will just spin as the kids dance around. Either you have to fix the disc in place so it doesn’t spin, or you have to remove the disc and attach the ribbons directly to the pole in fixed locations. So how can we produce a braid? First, have the kids dance around the pole so that they’ve wrapped some ribbon onto it. Next, have half the kids stand up holding their ribbon high, and the others kneel on the ground holding their ribbons low. Then have two kids skip around the pole in the direction opposite of the last turn, going over the kneeling kids’ ribbons, and under the standing kids’ ribbons. They go around once or twice (pick one), then stop. Repeat this with other pairs of kids if you want, varying the direction as needed to make it work. Once you’ve done that enough, the kids that are standing can kneel, andthe kneeling ones can stand, and a different pair of kids can skip around the pole. Again, repeat with other pairs of kids if you want. However, even one short cycle by a pair of kids should tie down enoughof the ribbon so that it won’t come unwrapped if the rest of the kids all get up and dance around the pole in the opposite direction. What’s another way of braiding? Have the kids stop as described above, with half the kids holding their ribbon high and half kneeling and holding their ribbon low. Then two kids skip through the middle, like from 12 o’clock to 6 o’clock on the circle. Then two other kids can skip through the middle from, say, 3 o’clock to 9 o’clock. Then everyone gets up and skips in the other direction, wrapping the ribbon around the pole in the other direction. Then they stop, and the kids who knelt get to stand and the kids who stood get to kneel. Then different pairs of kids skip through the middle again. For variety, this one could probably also be done with all the kids kneeling while the pair of kids skip across the circle. Just repeat whatever sequences the kids have learned so that they put a weave on the pole. Every kid can have a turn dancing through the middle,or around, or whatever. What is the significance of pairs of kids? The dance seems to have two general types of moves: those done by everyone in unison, and those done by pairs. This makes it easier for kids to get the right cues during the dance. Try to always pair really young, immature, or inexperienced dancers with dancers who are likely to remember the moves.Then tell the dancers to be sure to dance in unison. Often, mistakes made in unison will still look right to an audience of doting parents and neighbors. What’s the first step to a successful Maypole dance? If you plan to do this as a public performance, rehearsal is ESSENTIAL.Collect a group of kids, have them wear leotards or exercise clothes, work out the dance ahead of time, and PRACTICE. One afternoon practice shouldbe fine. The very first one might take a bit of effort, just to teach yourself what to do, as well as the kids. Even with a good practice session under your belt, don’t have high expectations.Kids are supposed to have fun, not produce an elegant and temporary weaveof ribbon on a pole. What if a kid messes up the steps? A nice feature of this dance is that a kid can make the wrong move, or be too slow, and not throw everything off. If the rest of the kids pay attention, they can take their cues from the action, instead of synchronizing to the music. The music we used had a sort of verse or stanza structure, but the cycles of the dance always ran independently of where we were in the song. Nobody seemed to mind. It’s essential NOT to be compulsive about creating an elegant weave.These are school kids having fun. You can either rip the sound track from that video or you can find a recording on eBay. What sort of music would you suggest, then? Just about any joyful spring-spirited music should do, as long as thekids can comfortably skip in time to. There must be dozens of tunes that would suffice for this purpose.